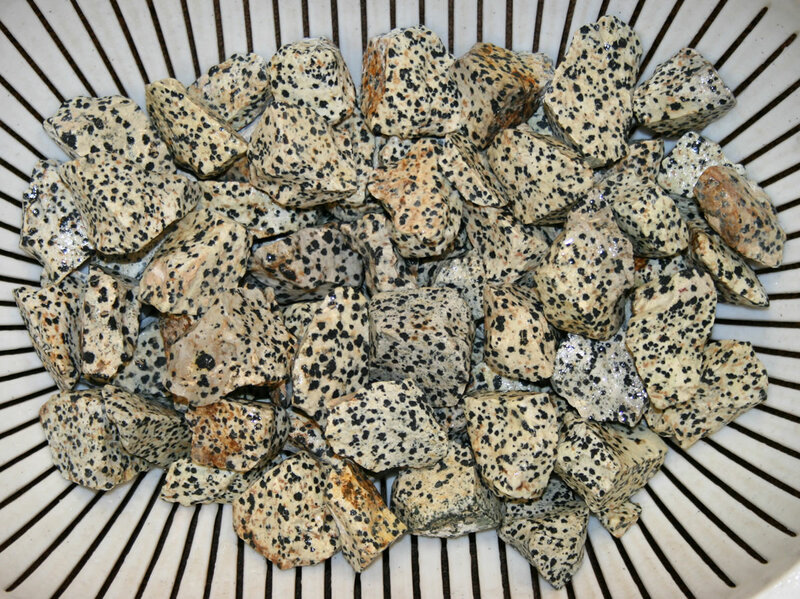 Dalmatian Stone: aka "Dalmatian Jasper"
This image shows a 4-pound bag of dalmatian stone tumbling rough, dumped into a colander and sprayed with water to reveal its full color. Click on the image for a larger view. A few pieces of our Dalmatian Stone rough that we tumbled. It shapes nicely and polished to a soft glow. We were pleased with the results, and that is why we are now offering the rough to our customers. Dalmatian Stone (also known as "dalmatian jasper") is a black and white igneous rock mined in Chihuahua, Mexico. It is a favorite tumbling rough of people who are new to the rock tumbling hobby. Why? It quickly develops a nice rounded shape in the tumbler and polishes to a soft glow. It makes success easy. And, the tumbled stones are a novelty because of their name and appearance. 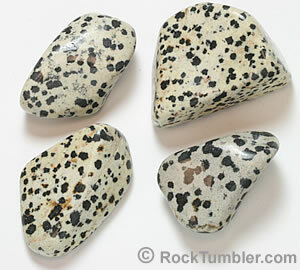 The Dalmatian Stone that we are selling is mostly in 3/4" to 1 3/4" pieces. The four pound bags might have a few smaller pieces and a few larger pieces. That is expected when buying bulk rough. The background color of dalmatian stone can range from a light brown to a bright white. We like the material that we are selling because the density of the black spots is just right to deserve the "dalmatian" name. There are not too many and not too few. When this material first hit the lapidary market almost everyone called it "Dalmatian Jasper." It looks like the breed of large white dog with black spots. The name was easy to remember and it stuck. It really stuck. Nobody had trouble remembering the name - even after hearing it only once. Some people will guess the name if you ask them to try. The problem -- this stuff isn't "jasper." Here's an example of what Dalmatian Stone looks like when it has been tumble-polished in a rotary tumbler. The stones round nicely and the polish is more of a "soft glow" instead of the "bright glassy" polish that develops on pieces of agate and quartz. Dalmatian stone is not a jasper. It is an igneous rock composed of white albite (a feldspar mineral) and black arfvedsonite (a mineral similar to hornblende). Arf! Some specimens might contain similar but closely related feldspar and amphibole minerals. Dalmatian stone shapes nicely in a rock tumbler in minimal time because it is softer than the agate, quartz and jasper that most people are used to tumbling. The minerals in dalmatian stone have a Mohs hardness of about 6, while quartz, agate and jasper have a hardness of 7. If you want to know more about Dalmatian Stone we have information about it and its lab analysis here. 1) Shapes Quickly: Dalmatian Stone is an igneous rock composed of white feldspar and a black hornblende group mineral (you can find more details here). These minerals have a Mohs hardness of about 5 to 6 so they will shape more quickly than the agate, jasper and petrified wood that most people tumble - and that have a Mohs hardness of about 7. For that reason, we suggest tumbling Dalmatian stone for less time during the coarse grit step of the tumbling process. 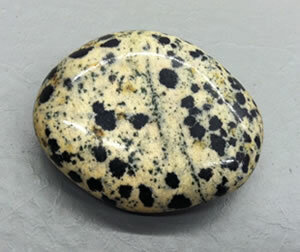 2) Media Needed: This Dalmatian Stone ranges in size between about 3/4" and 1 3/4". For that reason, ceramic media should be added to fill the voids between the large pieces of rough. These will provide a smoother tumbling action and deliver grit to the surfaces of the larger pieces of Dalmatian Stone. We would tumble a mixture of about 25% media and 75% Dalmatian Stone. Additional media should be added after the first tumbling step if the barrel volume drops below recommended levels. Coarse Grit Step: Fill your barrel 2/3 full of rough and media (or small rough). About 10% to 20% of the material in the barrel should be ceramic media or small size rough. Then add 2 tablespoons of coarse (60/90) grit per pound of material in the barrel (rough + media). Add enough water to cover the rocks and tumble for one week. Medium Grit Step: Put your cleaned rough and media back into the barrel. If the barrel is less than 2/3 full, add additional broken-in media to get the barrel up to its proper operating level. Then add 2 tablespoons of medium (150/220) grit per pound of material in the barrel. Finally, add enough water to put the water level just below the top of the rocks. Then tumble for 1 week. Fine Grit Step: After clean-up, put the rocks and media back into the barrel with 2 tablespoons of fine grit per pound of material and enough water to bring the water level up to just a little below the top of the rocks. Tumble for one week. Your rocks should be really smooth after this step. Polish Step: Make sure that your barrel and rough/media mix have been cleaned thoroughly of all grit and rock mud. Then place the rough and media in the barrel with two tablespoons of TXP polish for each pound of material in the barrel. Then add enough water to almost cover the rocks. Tumble for one week. Burnish If Needed: If you have done a good job of tumbling, this tumbled magnesite will have a nice soft glow. It will not have the "glassy" polished luster that you can produce on agate. Burnishing will probably not be needed, but if you want to clean up the rocks, you can find the full burnishing instructions here. Check the bowl every 8-12 hours to ensure the action is still good. If the action has slowed, add water a little at a time until the action is back to normal. If the mud gets too thick you will need to do a complete rinse of the material and bowl. After rinsing, add fresh grit and water and start tumbling again. You are done with medium grit when you are satisfied with the shape and smoothness of the stones. Usually 3-4 days for us with this material. Give the material and bowl a thorough cleaning before moving on to fine grit.